Did you know you can make an extra $1,000-$10,000 a month by flipping furniture and other items for a profit? If you aren't sure what a flipper is, let me explain. 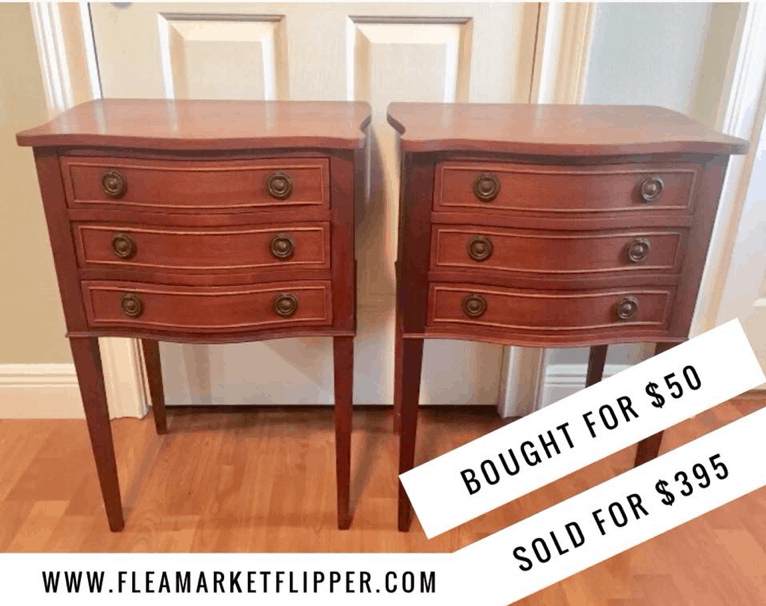 Flipping is finding items that nobody sees value in and selling them for a profit. Guys, if I wasn't blogging full-time, I'd be 100% in on becoming a full-time flipper. Last year at Fincon (personal finance conference) I met a couple who created a six-figure flipping business by working only 20 hours a week. Even if you don't want to become a full-time flipper, you can flip as a side hustle. Flipping is awesome because of its many benefits, including a flexible schedule, working fewer hours, and growing your income. Melissa and Rob were generous enough to send me 5 tips to help people who are interested in flipping furniture and increasing profits. Here we go. We are a little different than the average furniture flipper. We aren’t experts in repurposing in regards to painting, sealing, etc. What we are experts in is selling the furniture that is redone. We have sold many pieces over the last few years and we wanted to share some of our top tips for doing the same. 1. Buy at a good price. Buying a piece of furniture at a good price is so important when looking to make a profit on it. You are putting in time, energy and supplies to repurpose the piece, so it needs to be something that is a great price! And you can even find a lot of pieces for free if you are looking hard enough! When people move or replace furniture, a lot of times they just want the piece gone, so they give it away. This one goes along with buying the item at a good price. You also don’t want to spend too much on your supplies to fix it up. It can be really tempting to put on fancy pulls and new paint and brushes for each project, but you want to keep your costs as low as possible because every dollar spent eats into your profit. Instead of buying supplies right when you need them, look for them when they go on sale and stock up. Some stores like Hobby Lobby puts their pulls on sale certain weeks of the month. You can even find some supplies at thrift stores and yard sales when you are out and about. Pictures are huge when selling your furniture. You want your potential buyer to be able to see that piece in their home. Pictures that are cluttered, don’t show the full item, aren’t clear, or contain pets in them are no good for selling your item. I know those sound pretty common sense, but you would be surprised at the number of pictures posted that contain these things! You want pictures that are clear, show the full furniture piece in the first photo, and with no extra clutter (or pets) in them. 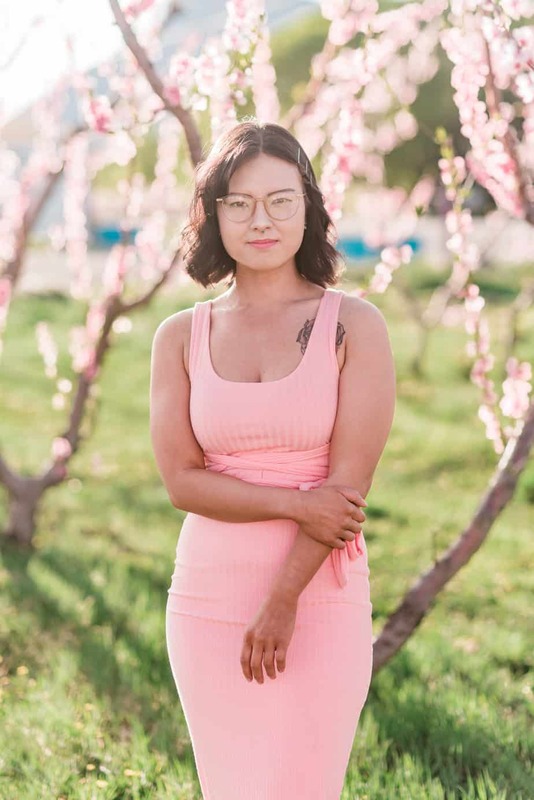 There is no need for a fancy camera and equipment if you can find a spot with good lighting. And if you don’t have good lighting (natural lighting by a window is best), you can rig a few lamps to work. We only recently purchased a few soft boxes for lighting. But for the past 20 years have made lamps and windows work. 4. Price your item right. If you are wanting to make a good income or side income from flipping furniture, you have to price your item right. The hard part about pricing furniture is you usually can’t get good comparables because they are unique pieces. We see a lot of items priced well for their work, but then we also see a ton of pieces priced way too low on local selling apps like Facebook Marketplace and OfferUp. With local selling apps, you are very limited to who you can sell to, which is why we choose to use eBay to sell most of our pieces. It reaches so many more potential buyers! This is something that can set you apart from other furniture flippers. It’s something we actually think can be a HUGE game changer for your business. We ship items freight all the time and it’s not as hard and intimidating as people make it seem. If you can move your end tables/dresser/desk to an area to refinish it or paint it, then you can ship it freight. You don’t need any fancy equipment like a forklift to do it. 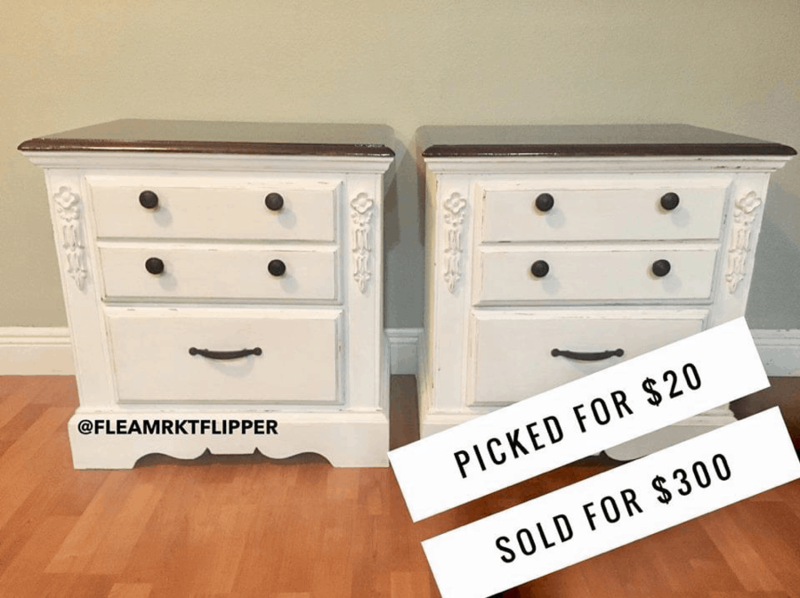 Here is a set of nightstands that I re-finished with chalk paint. 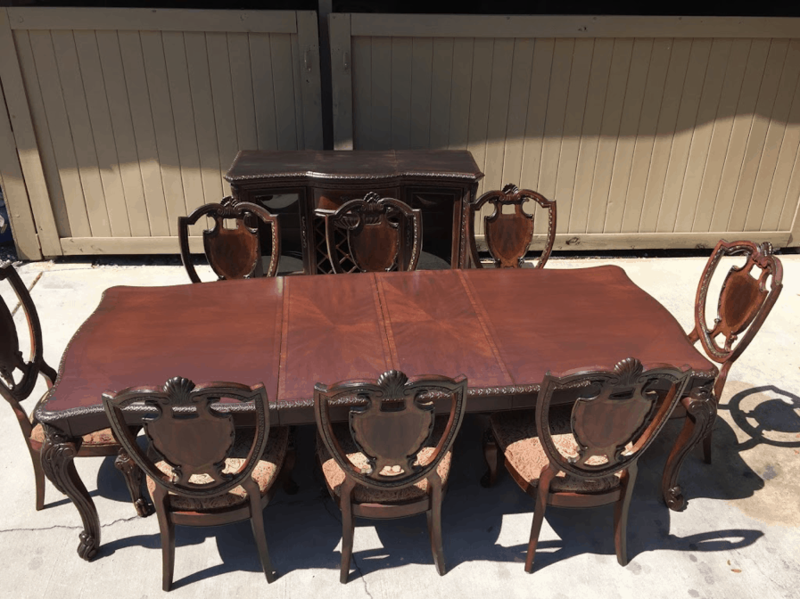 And this dining set we purchased for $350 we sold it for $2,200 plus shipping! And not everything has to go freight. We shipped these two end tables in boxes through FedEx. We bought them at a yard sale for $25 and sold them on eBay for $395 plus shipping ($120). Don’t let shipping intimidate you! It could be the thing that brings your furniture flipping business to the next level! Are you interested in becoming a flipper? I am a Flipper University Student and Rob & Melissa are so awesome. They taught me everything I know! I made as much last month on my flipping side hustle as I did in my part time nursing job! We are saving to pay cash for an RV and we already have $13K of our $20K goal. Most of the savings is from my flipping gig!